The Universe has limitless gifts for you. It is listening to you and is ready to give you what you want. Manifest your dearest dreams and deepest wishes authentically, and the Universe will guide you to them. and take time to listen to the response. 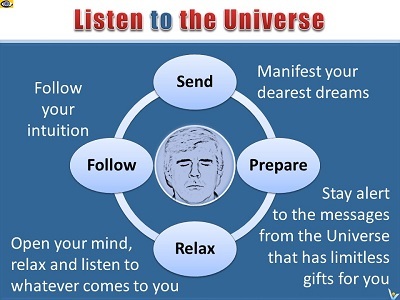 Stay alert to the messages from the Universe if you want to awaken your ability to recognize messages from the Universe and unlock your in-born gifts, capabilities and connection to the Divine. Trust your → intuition and your first thought. Signs and messages from the Universe tend to ‘pop’ into our awareness and trigger an idea or a gut feeling. There are no coincidences. Everything happens for a reason. If something or somebody suddenly catches your attention for an unknown reason, have a closer look. There is most likely a message there form the Universe for you. If you stay alert for messages from the Universe, it will eventually become a habit and your second nature. 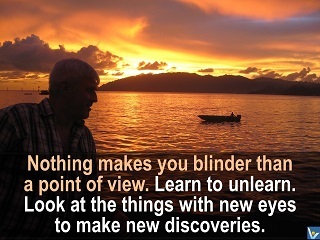 Gradually you will learn to distinguish things and events around you that may have special meaning for you. 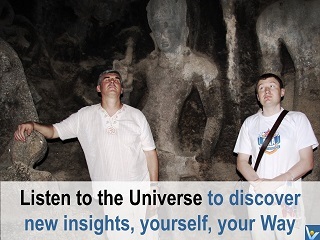 → Learn to contact the Spirit of the Universe. Enter a state of gratitude for your life, quiet your mind, and allow → enlightenment to enter your mind. 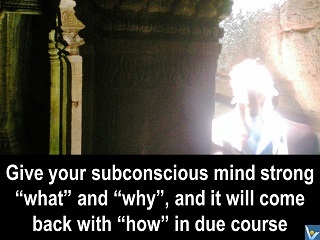 Meditate to achieve deeper attunement with Divine Consciousness. Just listen receptively to whatever comes to you. Open your awareness as wide as possible.